There was many times through my life I doubted myself. Especially during university going through art school. Every piece I created was a part of me, just as it is with all other artists. During one class in my final year , each student was given a price is paper. Printed in it were words that have helped me through dark times and reach my goals. 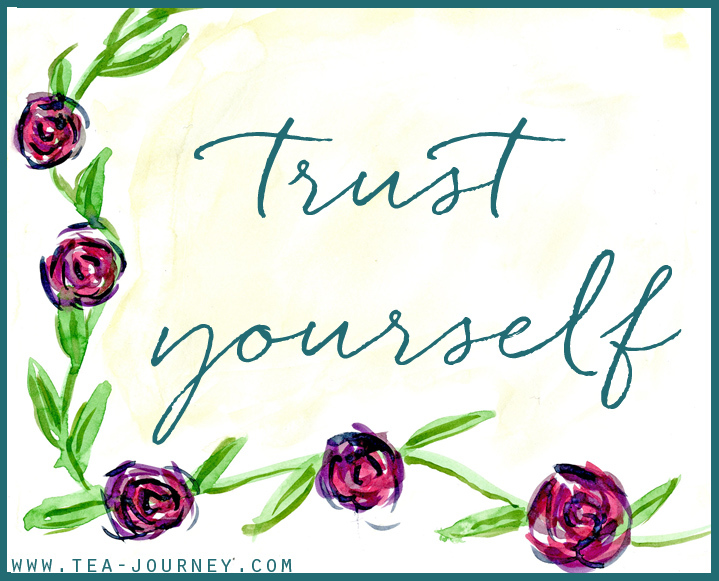 “Trust yourself”. Who would have known that those three words helped me begin to develop Tea Journey and even dream up new things for my portfolio. It even helped a dear friend of mine when he was conflicted with some personal matters. Those two words helped him find the answer he needed. I know I am not the only one who has moments when you need a little push. So feel free to print out the image above and place it somewhere you will see it every day, or even write it on a small card and carry it with you in your wallet. You hold with in you everything you need to do the best thing for your self, Trust Yourself. ps. If any guys want a less girly version, leave a comment and I’ll post one just for you.